Boston Handmade: Chronicle is in the house! Chronicle is in the house! 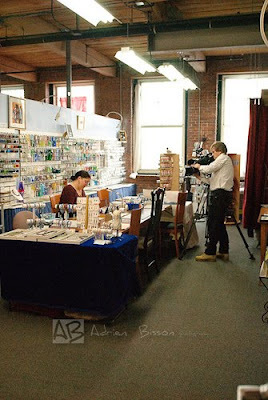 A few weeks ago, Western Avenue Studios was all abuzz because Chronicle was in the building filming for an upcoming episode. For those who don't know, Chronicle is a Boston-based daily magazine program that is locally produced. It has quite a following in the area and is well regarded. 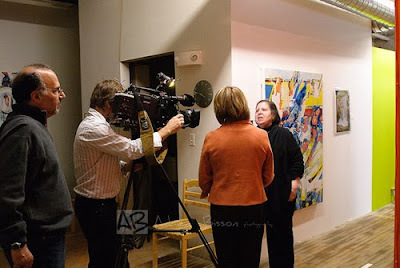 Chronicle interviews Executive Director Maxine Farkas. Photo by Adrien Bisson. The deadline was short - we found out on a Friday that the film crew was arriving on the following Tuesday. Yikes! I have to say, though, that I was amazed at what was accomplished over the course of 3-4 days. The artists really made this place shine. Lots of brooms and dust rags and paint brushes and drop cloths. I myself spent 3-4 hours on a Monday reorganizing and cleaning my own studio. By Tuesday, the building was ready for its closeup. 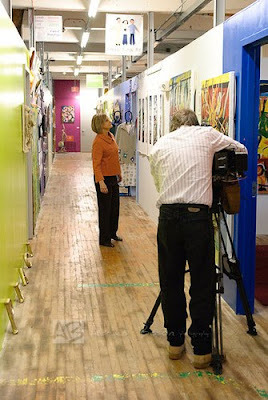 Chronicle host Mary Richardson enjoys our artsy hallways. Several of our photographers followed the video crew around as they filmed over the course of 5-6 hours. Chronicle posted a behind-the-scenes slideshow of some of the photos taken. Chronicle films painter Ashlee Welz Smith. Photo by Adrien Bisson. A mere 15 days later, the episode titled Art Colonies was on the air! Our segment was 5-6 minutes long, and is segment 3 of the 4 segments posted to the Chronicle website. I encourage you to watch the entire episode to discover hidden art gems all over the Commonwealth of MA. Artists await the start of Chronicle! Photo by Liz Stewart. 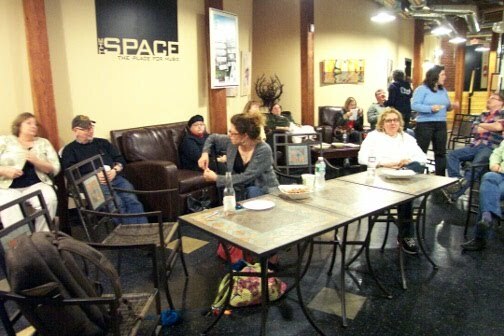 In honor of our 15 minutes of fame, the artists in the building had a viewing party down in The Space, our neighboring cafe and recording studio space. It was great to watch the show with my fellow artists, and it was exciting to see what made it into the program and what did not. To my surprise, a 2-second shot of me in my studio was in the footage! I didn't even know they were taking shots of me...I thought they were taking video of the pretty colors on my wall! All in all, a great experience. I hope it brings all the artists featured lots of visitors! The video links got deleted from the show info page, so here they are. Western Ave was featured in Segment 3.